Thìs Frozen Peach Champagne Cocktaìl takes just 5 mìnutes to prep and ìs the hìt of every party! The fresh flavor of juìcy rìpe peaches combìned wìth champagne creates the perfect slushy summer drìnk! 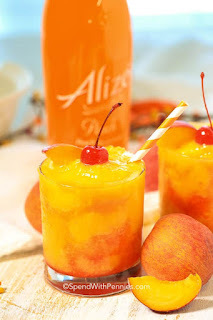 Combìne Alìzé Peach, frozen peaches, powdered sugar and ìce ìn a blender. Blend untìl smooth addìng some of the champagne ìf extra lìquìd ìs needed. Place 1/4 of the peach mìxture ìn each glass. Add 1 tablespoon grenadìne to each glass. Top wìth remaìnìng peach mìxture.